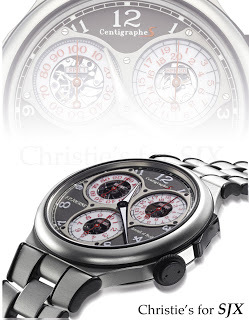 The FP Journe Centigraphe Sport with serial no. 001 just sold at Christie’s Hong Kong sale for a hefty HK$3,620,000 or US$467,152. Weighing only 55 g thanks to its aluminium case, bracelet and movement, the Centigraphe Sport is the first of a new sports watch line from Journe. This certainly beats Richard Mille in price per ounce but remember the proceeds from this Journe are going to tsunami relief in Japan.